Volunteers make our operations possible. Volunteers drive our organization. Their efforts allow us to hold events, sell locally made artwork in our gallery, and keep our doors open on a day-to-day basis. Our volunteers are the heart and soul of Guttenberg Gallery and Creativity Center! Many volunteers choose to help in the studio, by learning to use the media we offer and teaching those skills to others. 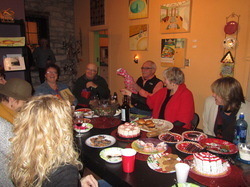 Other volunteers help in the gallery, lead special events, or act as a network to connect our organization with new artists. We invite you to join our group of fun-loving, art-supporting volunteers!